Arizona was one of the states hit hardest in the recent housing bubble bust. However, the state is starting to see a turnaround in the housing industry. This is especially true for the Tucson Real Estate market. Luxury homes in Tucson have always closely rivaled the luxury home market in Scottsdale. One particularly popular luxury Tucson real estate location is the community of Dove Mountain. Dove Mountain is a prestigious community located in the Tortolita Mountains. The community is situated on 6,200 acres and includes over 3,000 custom-built Tucson luxury residences and a retail shopping plaza for residents. Owners of the luxury Tucson homes located in Dove Mountain have many amenities available for their use. Many homes offer built-in barbeques, in-ground pools, and even separate guest quarters. Each home also offers residents spectacular views of the Desert Mountains, valleys, and canyons located throughout the community. There are also three golf courses located throughout the community. These golf courses include The Golf Club at Dove Mountain, The Gallery Golf and Sports Club, and Highland at Dove Mountain. Residents, and their visitors, can also enjoy a wide range of outdoor activities throughout the community. There are many miles of walking trails, as well as hiking, mountain biking, and equestrian trails throughout the 6,000 plus acre community. The various clubhouses also offer a range of activities, both for individuals and groups. Residents looking for an adventure have only a short drive ahead of them. The city of Tucson is a short drive from the luxurious confines of Dove Mountain. The city is regrouping from the recent housing problems and is once again flourishing. There are many shops, restaurants, clubs, and other activities to be enjoyed throughout the city. Several historical sites, as well as the zoo, also offer many opportunities for day trips away from your desert oasis. There are several opportunities within Dove Mountain for individuals looking to purchase Tucson Real Estate, the prime choice being The Residences at The Ritz Carlton, Dove Mountain with estate homesites and customizable residences of various size and price. 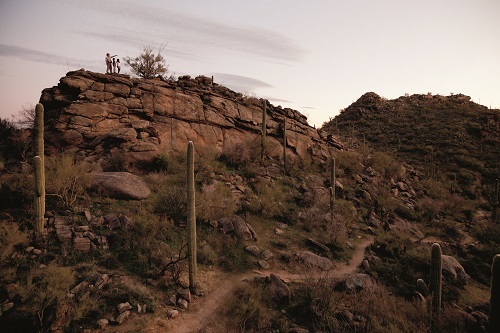 However, each home is guaranteed to offer the best amenities and serenity that the southern Sonoran Desert can offer. Homes currently for sale range from sizes of around 2,000 square feet to over 5,000 square feet. Lot sizes also vary from half an acre to several acres. Prices range from half a million to several million, depending on the size of the home, the size of the lot, and the amenities included. Now is a great time to purchase a luxury home in Tucson, Arizona. The property values are starting to steadily increase again. People looking to retire, or purchase a second home, in Arizona should consider luxury homes in Tucson. These homes are just as beautiful and spacious as homes in Scottsdale, but offer a far superior lifestyle.